Rosenbaum Contemporary is presenting Immediate Geographies, an exhibition of oil paintings by German Contemporary artist Thomas Hartmann. A special preview of the works will be held at Rosenbaum Contemporary’s Miami gallery inside the St. Regis Bal Harbour Resort, 9703 Collins Avenue, in Bal Harbour, Fla., on Oct. 2 from 7 to 10 p.m. The main exhibition opening will follow at Rosenbaum Contemporary’s Boca Raton gallery, 150 Yamato Road, Boca Raton, Fla., on Oct. 3 from 6:30 to 9 p.m. The artist will be present at both events. The public is welcome, and attendees are asked to RSVP by Sept. 27 to rsvp@rosenbaumcontemporary.com. Hartmann, born in Zetel, Germany, has received several awards including the Overbeck Prize for Fine Arts; the Art Prize for Artists of Düsseldorf, Germany; and the Willi Oltmanns Prize for Painting, Delmenhorst. His work has been shown throughout Europe and the United States in numerous venues including the Solomon R. Guggenheim Museum in New York, the Toledo Museum of Art in Ohio, and the National Library in Warsaw, among others. The selection of works for Immediate Geographies, curated by Howard Rosenbaum and Daniella Sforza, is based on Hartmann’s narrative of vast landscapes marked by the continual streaming of figures, lines and specks in a silent flux of cause and effect. Works such as Hartmann’s Land und Leute (Land and People) speak to the resulting impressions, shadows and lines that trail behind, connected to each other, shaping the topography. 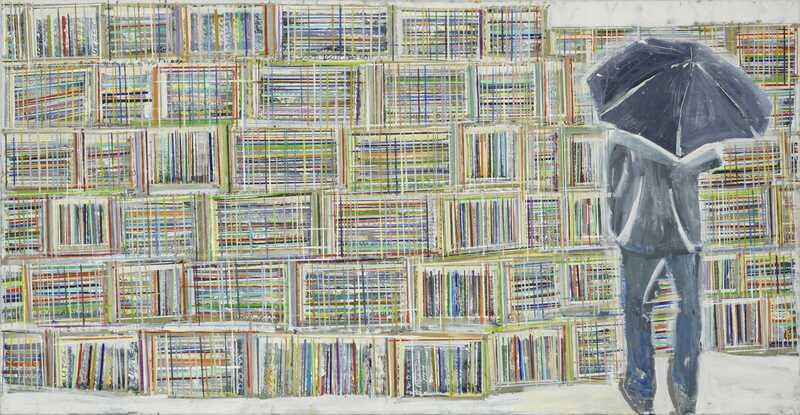 Even when the canvas is awash with towering books, as in his Flohmarkt (Flea Market), Hartmann is creating landscape: manmade and temporal. His cathedrals, flat lands, woods and ridges trace the relation between the figurative and the abstract and compel us to view his work as if from Google Earth, zooming in from a distance to reveal at once a truthfulness about ourselves in minutiae: separate and at the same time fusing and melding into the vast open planes upon an infinite horizon, which humanity transforms in grooves and bounds. 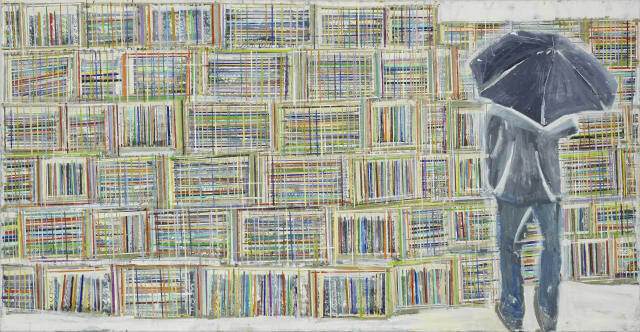 It is this idea of being connected in the vast pictorial possibility that renders Thomas Hartmann’s art immediate…in every sense. Regular exhibition hours are Tuesday through Saturday, 10 a.m. to 5 p.m., in Boca Raton and Monday through Thursday, 10 a.m. to 9 p.m.; Friday and Saturday, 10 a.m. to 10 p.m. and Sunday noon to 9 p.m. in Miami. The exhibition closes Nov. 23.